Ashok Bhalotra drew up the masterplan for this new suburban area on an elongated plot in Rijswijk. One sector of the plan, Arcadia, consists of 266 units in two roughly 500 metre long blocks with rounded heads and cut through by side streets. A yearning for the romanticism of 19th-century architecture is rendered here in contemporary materials: milk-white concrete elements, pale yellow brick and steel railings made to resemble wrought iron. 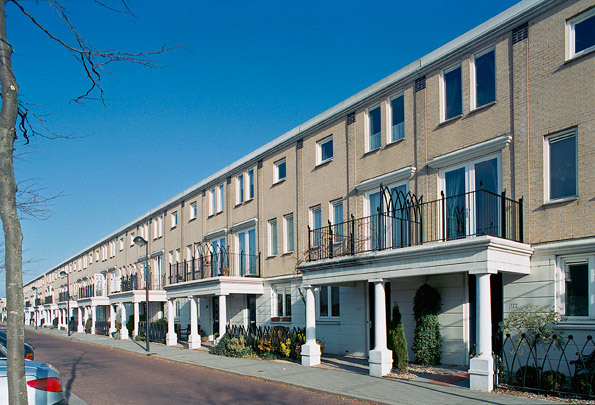 Colonnades, balconies, piers and cornices combined with the concrete cladding elements take this architecture close to the classicist ideal.